It is a pleasure to write a winning blog like this when our team is visiting a tough pitch such as South Africa. Us winning in India is actually no big deal seeing as our pitch conditions are designed to suit our needs and preferences. Winning in South Africa is a fantastic. Take a bow. To beat South Africa on that wicket was really really something. A tremendous effort by the men in blue. We have taken 60 wickets in three test matches. This is a rare event in away from home series. Looking at how the lineup on Fantain Fantasy App worked. In my lineup, I had picked Virat Kohli as the captain. He earned 69.5 points giving me almost 140 (the captain is awarded twice the points he makes on the app). 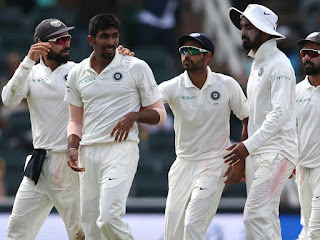 The winner who played in the 250 rupee pool and won a whopping thousand rupees - he made Bhuvneshwar Kumar as his captain and Vernon Philander as the VC. A very smart move seeing as this pitch is the playground of fast bowlers. The pitch can clearly decide not only the bowlers in your fantasy lineup but also the ratio of batsmen to bowlers. And if you make them your captain, you are in for the winner’s position on the Fantain App. This winner also had Kagiso Rabada, Mohammed Shami and Morne Morkel on his lineup. Virat Kohli followed by I Sharma. Bowlers lead the pack here. Player of the match - Bhuvneshwar Kumar. Player of the series - Vernon Philander. It was an excellent win by India. Sensational fast bowling. This is really good cricket. A well-fought series that demonstrated high-quality cricket. An easy pitch would not be much of a challenge. Both the teams had their moments as the trophy was handed over to Du Plessis and team. We may have lost the series. But we have restored pride. Brought some home to the boys. With the first ODI match starting on the first of February, we need one day rest and then practice hard to learn how to make the best of the conditions that this country brings in the world of cricket. Editor’s Pick (Test): India - South Africa. Blog Time: South Africa wins by 72 runs.